Beebe Healthcare is proud to announce that pet therapy is now being offered to patients at Tunnell Cancer Center and Beebe Outpatient Surgery Center on Route 24 near Rehoboth Beach. Beebe Healthcare offers pet therapy for patients, visitors, and team members. This alternative therapy has been shown to decrease blood pressure and improve even short hospital visits for patients and visitors. In addition, having a dog visit team members has been shown to greatly reduce stress. Beebe is working with PAWS for People, a Wilmington-based nonprofit 501(c)3 pet therapy organization that recruits, trains, certifies, and places therapy teams in Delaware, Maryland, Pennsylvania and New Jersey. The PAWS organization helps coordinate teams at more than 130 locations, which now includes Beebe Healthcare in Lewes and Beebe's Tunnell Cancer Center near Rehoboth Beach. All of the dogs and handlers have gone through specific training courses for healthcare visitations. 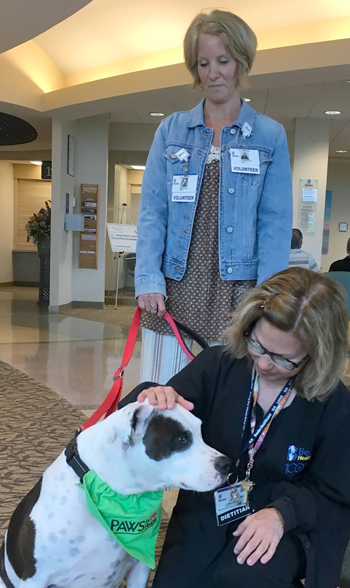 Shown (left to right) are Beebe team member and PAWS certified handler Christy Duda with her dog Bruce Wayne AKA Batman and Beebe Dietitian Kim Westcott at Tunnell Cancer Center. For more information on pet therapy at Beebe, contact Lee Halloran at (302) 645-3531. For more information on Paws for People, go to www.pawsforpeople.org.